Dedicating this lil' masterpiece of mine to my dear chatterbox friend at MT, Bubbles! *starts blowing bubbles* :nya: Hope ya like it everybody! "That light is my radiant heart"
I'll fly towards it, with my broken wings. the wall looks flawless, and so does the extraction. You have really done some high-class work here, you definantly have skills for these sort of things. Everything looks flawless, great artwork. What an adorable wall for bbls! I wuv the scan! And the sunflowers are so bright and cheerful ^^ But I don't understand the title. I guess I should finish watching Air >_< The title is so sad and yet the wall is so happy. Beautiful work though! wad a cheerful wallpaper! it juz seems to brighten up my day juz by looking at it ^.^ Great work! wow, a very matching and pretty wall ^^ I dont know how you do it, you make wallpapers so fast and it turns out nicely! awww...its pretty wall, the girl is so cute, and i love the sanflower field too..
WOW its so pretty, love the scan and the background is soo beautiful! hmm...nicely done lol..yup, I hate the extracting time too...waste most of my time lol..
soo sweet the girl and the bg ..
Wow. It is very, very, very beautiful! I love it. You have certainly improved a lot. I mean it. Adds to favs. Wow Nice work ^ ^! The carecter very lovely and color background look relax. Woow what a nice wallie! The bg looks great and the scan is cute 2! OMG! I love Misuzu! This is one of the awesomest Air wallies yet! waaaahhhh...do you mean me, enchantress? well, you did a superb job in the extraction, especially around the hair where it's so intricate! 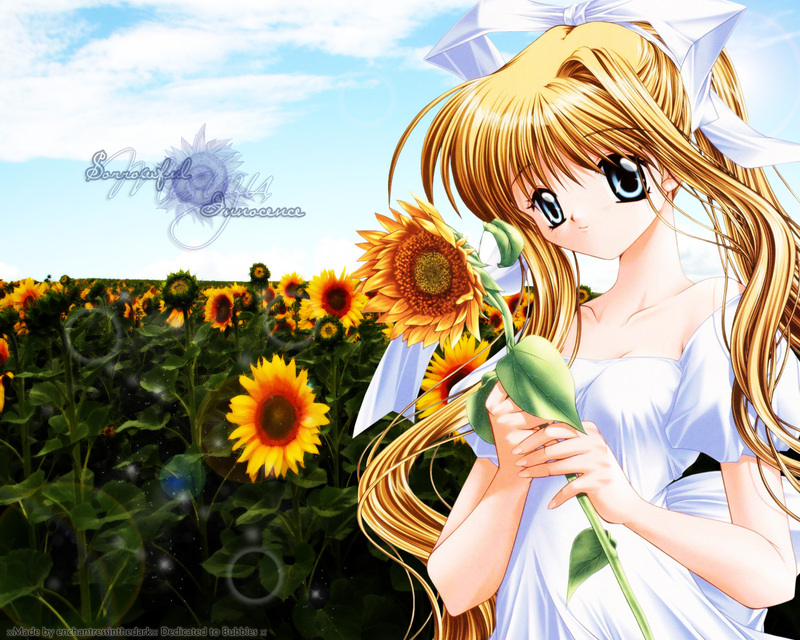 i also luv your sunflower background because it suits misuzu and the atmosphere of your wallie perfectly. and your text and sunflower of your title is so lovely and really adds a nice detail to the wallie. it's so refreshing to see text that really compliments the wallie instead of being a distraction.